Milan is an easy town to visit by foot: the whole centre can be crossed in a couple of hours stopping everywhere for shopping and sightseeing. Milan is an easy town to visit by foot: the whole center can be crossed in a couple of hours stopping everywhere for shopping and sightseeing. Taxis cannot be flagged down as they pass you along the street unless their ‘taxi’ light is on. They are stationed at special taxi parking stands in most of the major squares, train stations and at the airport and can be requested by phone. TaxiBlu 4040, AutoradioTaxi 85 and 6969 roughly represent 80% of Milan’s taxis. Not all taxis accept animals on board and not all of them have the possibility to let you pay by debit/credit card. You should tell the contact centre officer your special needs before telling your pickup address. You should receive a message confirming that they received your request, then another message whose content include either a booking confirmation or a decline. CONFIRMATION: the taxi’s nickname in caps (e.g. ALABAMA 33) and the time it will take its driver to reach you (e.g. 05 minuti= 05 minutes). – From the Malpensa Airport: Milano/Malpensa € 95; Malpensa/Fiera € 65; Malpensa/Linate € 105. – From Linate Airport: Linate / Fiera € 55, Malpensa / Linate € 105 (Served by: 6969, TaxiBlu 4040, Autoradiotassi 85, Radio Taxi Freccia, and also by The Martesana Radio Taxi – phone: +39 02 2181). – From Orio al Serio: Please note it is located out of Milan, near the city of Bergamo. Prices range from 90 to 170 euro, the only available company is Radiotaxi 035 4519090. ATM is Milan’s local public transportation authority owning the underground subway system – The Metro, the more efficient mean of transport (free from traffic variations, traffic jams and usually also from strikes!) – tram and bus routes. The metro stops between 11.30pm and 00.30 (depending on the line and working days VS weekends); most trams keep on going until 1.30am and buses all night long. We suggest you check Milan night service on WhereMilan, it works from midnight until 6 am. Purchase your ticket before you get on the bus or the tram. Stamp your ticket as soon as you get aboard. Ordinary ticket (1,50 €) One journey on the metro and then unlimited bus, tram and metro usage within a 90 minute period. This ticket is not valid to reach RHO Fiera area. Go+return ticket to Rho Fieramilano (5€). Check the tariffs for the extra-urban subway. Evening ticket (3 €) Unlimited bus, tram and metro usage from 8 pm until the end of service. Day ticket (4,50 €) Unlimited bus, tram and metro usage within a 24 hour period. Two-day ticket (8,25 €) Unlimited bus, tram and metro usage within a 48 hour period. You can buy your ticket from the all authorized ticket sellers, usually including Tabaccherias (you will recognize a tabaccheria by the big “T” sign, see the right image), ATM POINTS (underground stations) and automatic ticket machines (underground stations). Bus drivers are not allowed to sell bus tickets. Owners of an Italian SIM card can text a message to the number 48444 containing the word ATM to get a regular ticket (1,50 euros) or the word FIERA to get a ticket for Rho Fiera (2,50 euros). A further step in the digital transformation of Milan’s public transport: today you can travel on the metro by paying easily, fast and safe directly at the ticket gate with Mastercard, Visa, Maestro and VPay contactless cards. You only have to touch your contactless card on the reader when you enter and leave the station. Remember that underground tickets should be validated two times: before entering the underground line and after the ride. If you want to know the best way to reach the places in which you are interested, try Giro Milano App, while if you’re experiencing problems getting around Milan with public transportation (strikes or doubts) you can tweet your questions to the customer care service @atm_informa (Mon-Fri, 7am-8pm). They also tweet real-time news on ATM services. Finally, if you need to get on the Malpensa Express it’s better if you check for strikes on Trenord’s Twitter account @Trenord_Press. 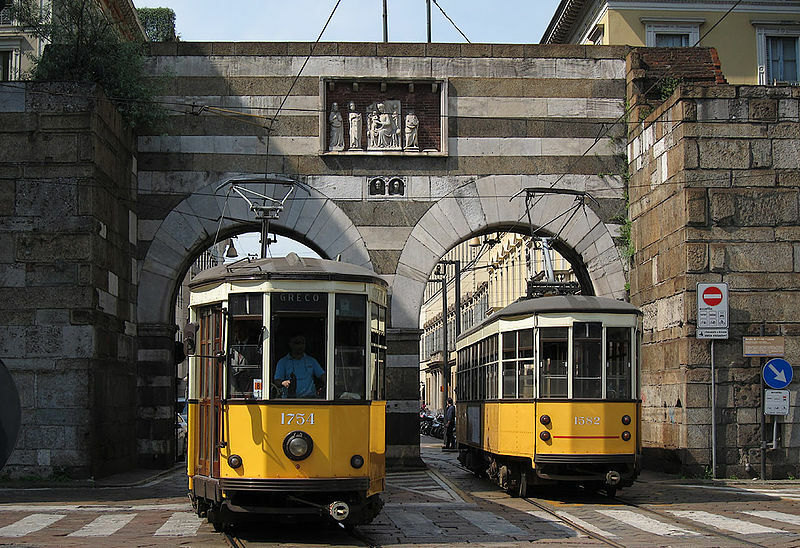 For more information regarding Milan’s public transport system, please refer to ATM – Azienda Trasporti Milanesi – Milan’s local public transport company. In particular, we suggest you try the very useful service ‘Calcola Percorso / Journey Planner’ under the voice of menu ‘Giro Milano’, this feature is also available from the APP. Milan, together with London and Lisbon, is fully committed to demonstrating that through new technologies urban mobility can improve together with energy efficiency, while carbon emissions can be significantly reduced. Car sharing services are more convenient for regular visitors. To join them, you need a driving license, a valid ID card or passport, a pay card. The most used services are Enjoy (free subscription, Fiat 500 car), Car2Go (Smart car minicars, great to find a parking spot in the city centre), Drive Now (elegant BMWs and Coupé cars) and Ubeeqo, Share and Go (mini electric cars). Beware: if you’re using these cars you can usually circulate in the limited traffic zone (ZTL) and park on residents’ spots (yellow ones, free). The city of Milan’s bike sharing service Bike-Mi is an alternative system of public transport to facilitate short trips within the city. In Milan, there are also city and tandem bike hire services, like Velociped. and the ‘free-floating’ bike-sharing system Mobike, which allows you to book a bike via the free Mobike App (App Store or Google Play), identify the position of the bike nearest to you and then leave it in any authorised parking area in the city or in a bike rack.